Luis Alberto Moreno is president of the Inter-American Development Bank in Washington. They are known as “los caminantes,” or the walkers. They are Venezuelan men, women and children who have left their country in search of work and opportunity. Some can’t afford airfare or even a bus ticket, so they walk for hundreds of miles to reach the borders of neighboring nations. In recent months, tens of thousands of these migrants have been slowly making their way along highways, camping by the roadside and relying on the kindness of strangers. They are a small subset in a much larger exodus, the likes of which our hemisphere has never seen before. While much has been said about the political and economic problems inside Venezuela that have led to this moment, I believe the scale and impact of this migration crisis are still not understood outside of Latin America and the Caribbean. 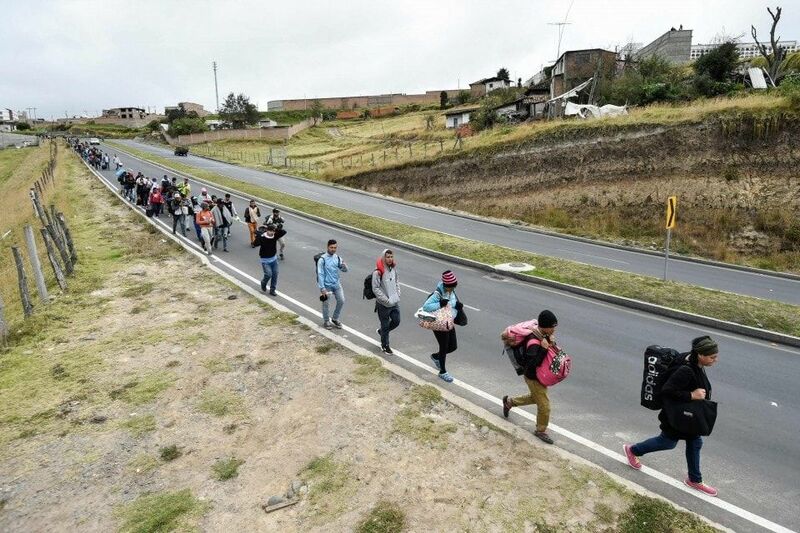 Consider this: While the United Nations estimates that 1.8 million immigrants have arrived in Europe by sea since 2014, up to 2.5 million Venezuelans have left their homeland during the same period. Roughly one-fifth of them have gone to Europe, the United States and Canada. Nearly all the rest — around 2 million individuals — have gone to Latin American and Caribbean countries. Colombia alone has received close to 1 million, while Peru, Ecuador, Chile, Brazil and Argentina, in descending order, have taken in most of the rest. But while average per capita income in the six European countries that have received the most immigrants during this period (Germany, France, Italy, Sweden, Austria and Britain) is around $46,500, measured in purchasing power, in the six Latin American countries listed above, the figure is less than $17,000. Europe can rely on modern civil services and well-staffed clinics and schools to process and care for immigrants. In Latin America, despite considerable progress in reducing poverty in recent decades, public services are underfunded and ill equipped to cope with local demand, much less to deal with this emergency. In Colombia, an economist with the Inter-American Development Bank has estimated that the government will need around $1.6 billion per year to fully respond to the emergency, a sum equal to 0.5 percent of GDP. This amounts to a negative shock to the economy at a time when Colombia urgently needs to accelerate growth. Venezuela’s neighbors have so far been sympathetic and generous toward the immigrants, not least because they remember how Venezuela welcomed millions of political exiles and economic refugees during the 20th century. In addition to waiving many traditional visa requirements, the region’s governments have used scarce public resources to provide food and shelter for the Venezuelans, while reassigning thousands of security and health officials to deal with the surge. Unfortunately, the situation has reached a breaking point. In recent weeks, we have seen incidents of violence and public protests against the immigrants, as overwhelmed officials struggle to prevent lawlessness and meet the needs of local residents who, in many cases, are also very poor. It is time for the international community to recognize the sacrifices that Venezuela’s neighbors are making, and to offer coordinated support that can prevent further conflict and instability. Last week in Quito, the government of Ecuador hosted ministers from 11 nations, including the six receiving most Venezuelan immigrants, to craft an integrated approach to the crisis. In their concluding declaration, delegates urged donors, the United Nations and multilateral banks to provide financial support. The United States and the European Union have already pledged emergency aid. Now we need a substantial source of grants and low-interest loans that governments can use to expand services, speed up processing and gather reliable data on arriving immigrants. Since most Venezuelans are unlikely to return home in the near future, funds will also be required to ensure their legal and orderly integration into local schools and job markets. The Inter-American Development Bank, which has offices in every affected country and decades of experience financing development programs with the region’s governments, is ideally positioned to create and administer a regional fund for this purpose. We are prepared to contribute initial grants and provide guarantees that, with pledges from other parties, could generate as much as $1 billion in concessional loans over the next two years. By contributing to the fund, donor nations could channel aid to where it is most needed, while avoiding the inefficiency of fragmented contributions. Despite the obvious political sensitivities surrounding this issue, I am certain this fund could quickly be made operational. In 2016, the World Bank partnered with the U.N. and the Islamic Development Bank Group to launch a similar effort in less than three months. That fund raised hundreds of millions of dollars to help communities in Jordan and Lebanon cope with the arrival of Syrian refugees. Migration, regardless of its motives, has long been a defining experience for people in the Americas. History has taught us that those in search of hope and refuge may someday be the ones who offer it. Venezuelans did not hesitate to extend a helping hand in the past. Let’s make sure we do the same for them now.